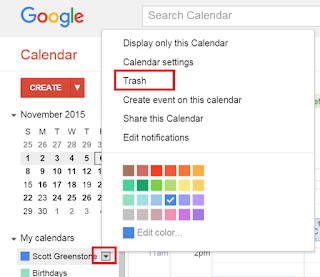 Yesterday, the calendar team rolled out a pretty big update to the features offered. Now, from the web interface, users now have access to deleted events and they can even restore up to 30 days worth of events that are in the trash. Its pretty simple, after deleting an event, just navigate to the Trash folder by clicking the down arrow next to the calendar you deleted from and choose trash. Once viewing the trash folder you can see your deleted events and when it was deleted. From there you can Delete forever or restore the item(s) by placing a check in the box to the left of each event you want restored. I accidently hit "permanently delete all events" and permanently deleted the event I was trying to restore!! Please help!!! Hi, I do not have the down arrow aside the name of the calendar. I have three dots that open the options, and there is no thrash option. I committed today an unwanted change and wish I could get back to the calendar how it was just before that. Is it possible?